If things at a distance appear blurred or you could not see them, then you could be suffering from nearsightedness, also known as myopia. In nearsighted glasses, there are three different kinds of eyeglasses to correct this condition. Nearsighted glasses have different lenses that help in minimizing myopia. Plastic optical lenses are made of a material known as CR-39, which is a type of resin. In general, this is recommended for those with mild to moderate nearsightedness correction. The prescription is approximately 2.00 diopters or less. 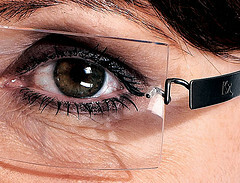 Polycarbonate lenses are more shatter-resistant and lighter compared to plastic lenses. Sometimes they are also called ‘safety lenses’ since they are more resistant to impact. Since they are lighter and thinner, they work well for a moderate prescription, normally in the power range of 2.00 diopters or above. This type of nearsighted glasses is recommended for children since they are active and are likely to need safety kind of lenses. High-index lenses are highly recommended for extreme nearsightedness. These lenses provide various indexes of refractions. The higher the number, the lighter and thinner the lens will be. Vision changes occur around the age of forty and one could become presbyopic, a condition affecting both near and far vision. Nearsighted people may need bifocals to read.